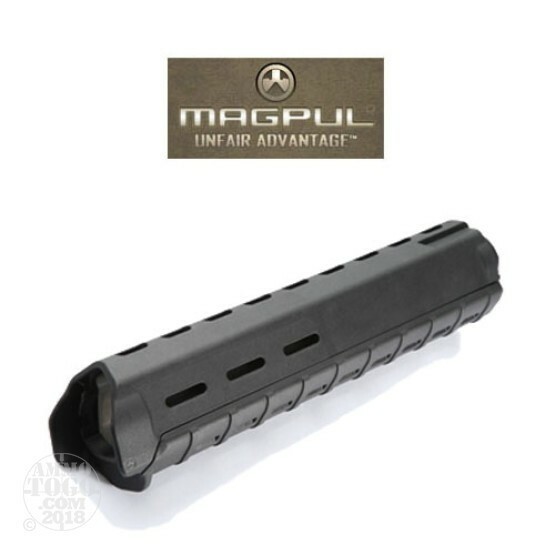 This is a Magpul MOE Hand Guard Rifle Length for AR-15 Black. The Magpul MOE Hand Guard for AR15/M16 rifles with rifle-length gas systems combines the light weight of a standard hand guard with modular flexibility. Designed with versatility in mind, slots at the two, six, and ten o'clock positions allow the attachment of optional Picatinny rail sections and other accessories for mounting tactical lights, slings, grips, etc. Reinforced, heat-resistant polymer construction provides operational durability without the weight and expense of an aluminum rail hand guard. Front extensions and lower lip provides additional operator protection from hot front sight assembly. Made in U.S.A.